ubermix 3.23 is out and available for your consideration. With nearly 9 years of active development behind it, ubermix is ready to take on your next generation devices, with strong touch support and updates that make it an excellent choice for both personal and school use. ubermix now includes hardware support, tools and theming that are designed specifically for touch devices, like the excellent Acer Travelmate Spin B1. One of the challenges for most operating systems designed for laptops - even Windows - is that they typically run in one of two User Interface (UI) modes: Standard or HiDPI. Standard UI mode is most common for displays with High Definition (HD) resolutions, which typically run 1920×1080 to 2560×1440 on modern hardware. For ultra-high resolution displays, like Apple's Retina and Dell/HP's Quad HD displays running at 3200×1800 or more, the operating system will switch to HiDPI mode, which essentially doubles the size of everything on the screen. While this may sound like it works well, it actually doesn't, because it doesn't take into account the actual size of the screen. 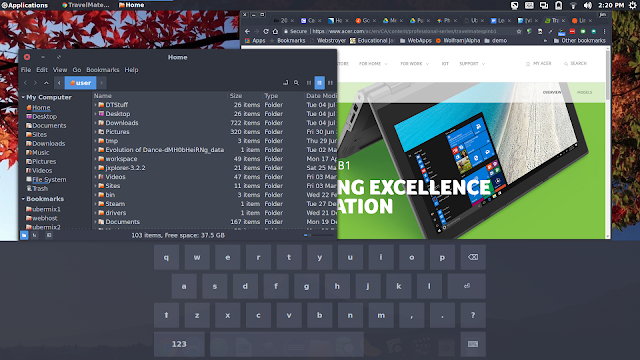 While Standard UI mode looks fine on a 14 inch, 1920×1080 screen, like that on the Acer Spin 7, display elements are really small on the the aforementioned Travelmate Spin B1, with its equal 1920×1080 display that is only 11.6 inches diagonally. Small elements are much harder to tap accurately with a blunt fingertip, creating a frustrating experience for the user. And switching the device to HiDPI mode (double-scale) makes everything comically large; easy to touch but severely limiting working space. To solve this problem, ubermix 3.23 offers convenient "in-between" UI settings, which make all of the UI elements roughly 1.3 times the size of Standard UI settings, creating comfortable, not-too-small, not-too-big sizing. In addition, touch friendly themes have been added, which provide additional spacing between UI elements, making them easier to touch without accidentally tapping on the wrong thing. For example, close, minimize, and maximize buttons are all intentionally larger and about twice as far apart. as are all of the applets at the top of the screen and Applications menu items. In addition, a customized version of the Displays applet is included, which automatically rotates the geometry of the touchscreen, touchpad, and and pen interfaces when the screen rotates on any device, functionality that tends to be hit and miss on typical Linux distributions. The kernel has also been updated to 4.10.15 on the installer USB key, bringing the ability to install without issue on the newest hardware. Both Inkscape and Scribus have been updated to the latest upstream releases (0.92 and 1.5.3, respectively), bringing improved performance, reliability, and new options to the applications. Mesh Gradients are now supported. Many SVG2 and CSS3 properties are now supported (e.g. paint-order, mix-blend-mode). Not all are available from the GUI. Altogether, about 500 languages and/or scripts are supported. Typing on the canvas and text rendering in general has become a lot faster. Previews for fonts are now available in font selectors. The "Text" tab has been removed from the Properties Palette and is now a separate UI palette. An import filter for Krita's KRA format has been added. Scribus now follows the XDG standard for configuration files. Color selectors display the color values as a tooltip. A script called "Caption" has been included, which adds a text frame to an image frame, based on the latter's proportions. Download the update today at http://ubermix.org/files.html , and be sure to let us know if you run into any trouble. To enable the touch UI on ubermix, simply open a terminal (ctrl-alt-t) and type "touch-setup", followed by the enter key.